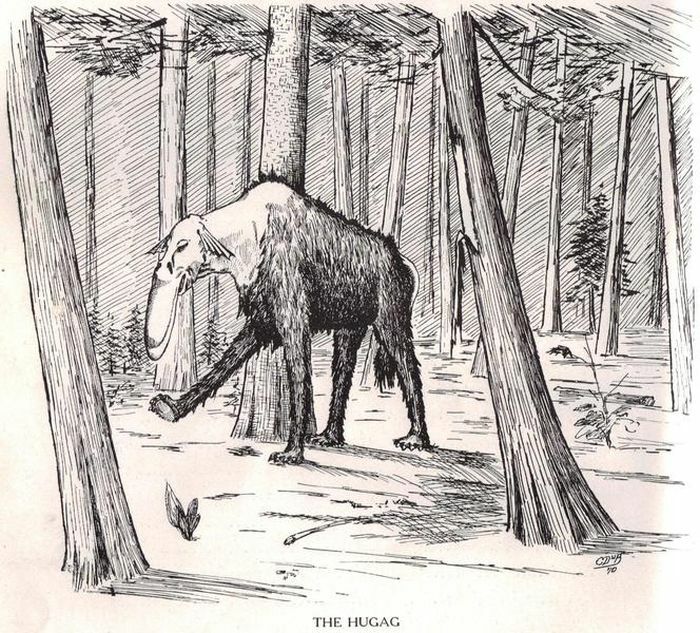 The Hodag is a folkloric animal of the American state of Wisconsin. Its history is focused mainly around the city of Rhinelander in northern Wisconsin, where it was said to have been discovered. It had "the head of a frog, the grinning face of a giant elephant, thick short legs set off by huge claws, the back of a dinosaur, and a long tail with spears at the end". 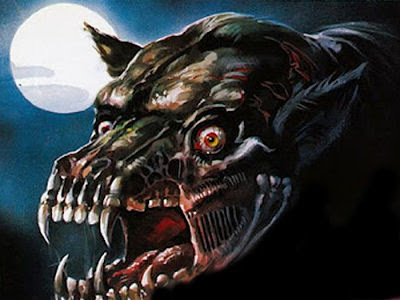 The group that found it stated they needed to use dynamite to kill the beast. The Hugag is a huge animal of the Lake States. Its range includes western Wisconsin, northern Minnesota, and a territory extending indefinitely northward in the Canadian wilds toward Hudson Bay. In size it may be compared to a moose and in form is somewhat resembles an animal. 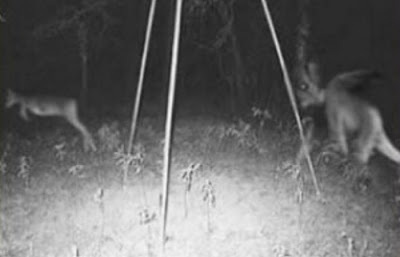 Very noticeably however are it's front joint less legs compel the animal to remain on its feet, and its long upper lip, which prevents it from grazing. Hidebehinds are nocturnal creatures from American folklore that prey upon humans that wander into the woods and was credited for the disappearances of early colonial loggers when they failed to return to camp. As its name suggests, the hidebehind is noted for its ability to conceal itself. 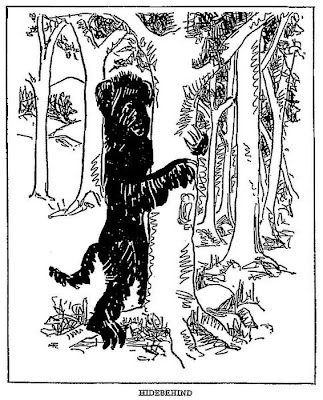 When an observer attempts to look directly at it, the creature hides again behind an object or the observer and therefore can't be directly seen: a feat it accomplishes by sucking in its stomach to a point where it is so slender that it can easily cover itself behind the trunk of any tree. Early accounts describe hidebehinds as large, powerful animals, despite the fact that no one was able to see them. 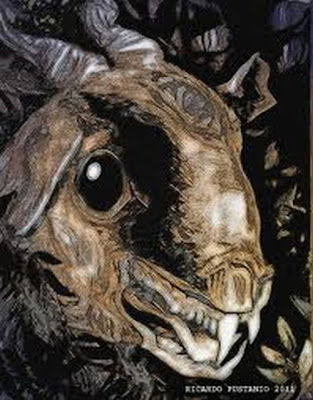 The Pope Lick Monster is a legendary part-man, part-goat and part-sheep creature reported to live beneath a Norfolk Southern Railway trestle over Floyd's Fork Creek, in the Fisherville area of Louisville, Kentucky. According to some accounts, the creature uses either hypnosis or voice mimicry to lure trespassers onto the trestle to meet their death before an oncoming train. Other stories claim the monster jumps down from the trestle onto the roofs of cars passing beneath it. Yet other legends tell that it attacks its victims with a blood-stained axe. 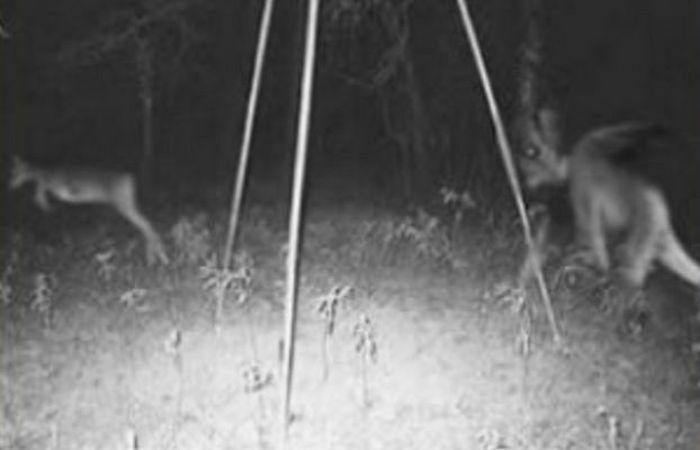 It has also been said that the very sight of the creature is so unsettling that those who see it while walking across the high trestle are driven to leap off. 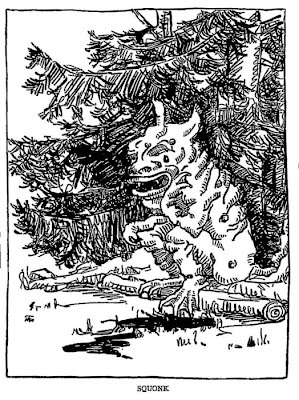 Sidehill gougers are North American folkloric creatures adapted to living on hillsides by having legs on one side of their body shorter than the legs on the opposite side. 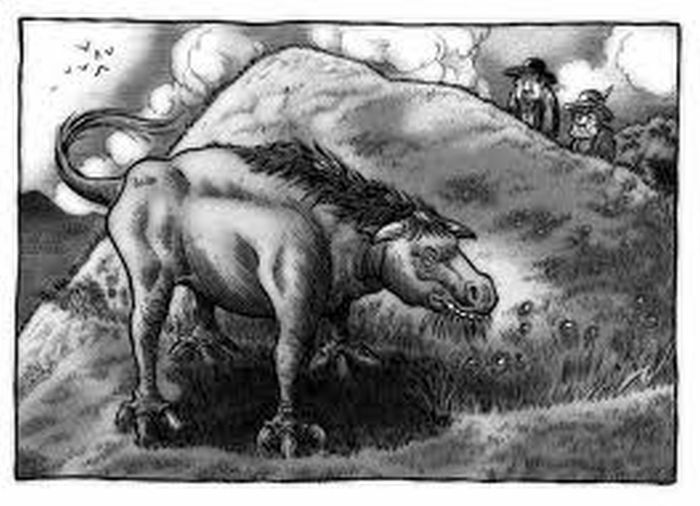 This peculiarity allows them to walk on steep hillsides, although only in one direction; when lured or chased into the plain, they are trapped in an endless circular path. A Vermont variation of the sidehill gouger is known as the Wampahoofus. It was reported that farmers crossbreed them with their cows so they could graze easily on mountain sides. 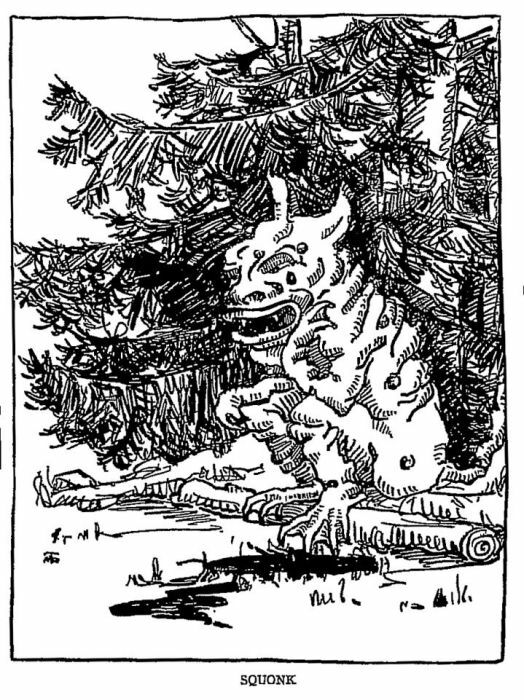 Tailypo is a creature of North American folklore, particularly in Appalachia. 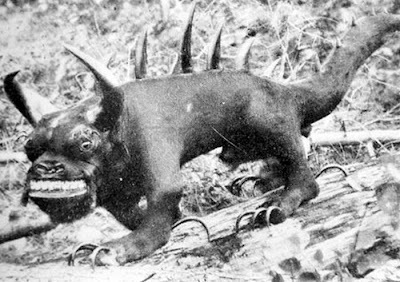 The Tailypo is usually described as being the size of a dog. 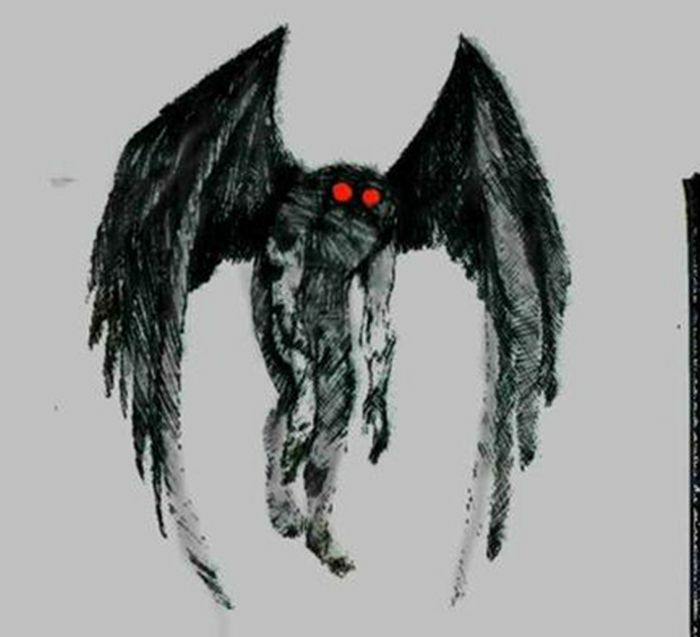 Depending upon the native culture of the storyteller, the Tailypo is said to have either yellow or red eyes. 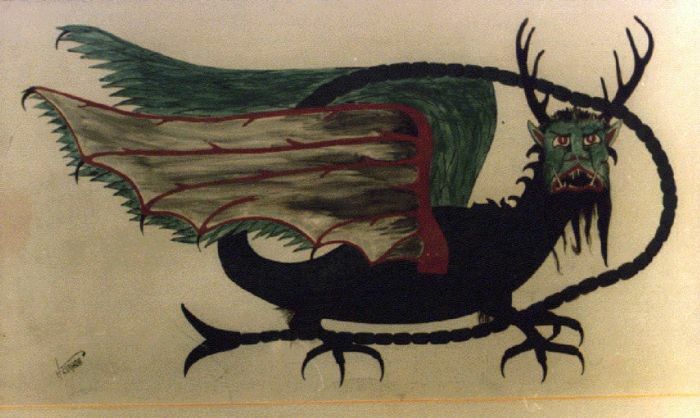 The Tailypo also has pointed ears and a long tail. 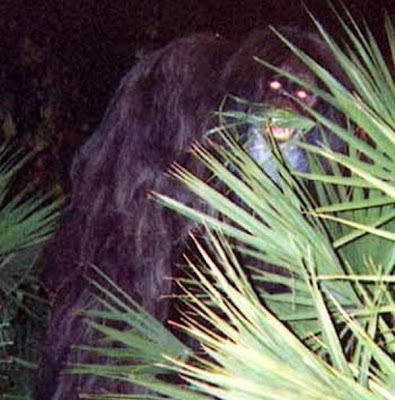 The creature is covered in black or dark brown fur and as it appears only during the night, it is even harder to see. 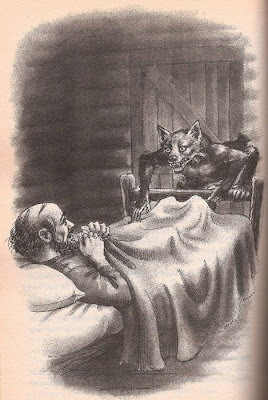 The Tailypo usually only ever uses its sharp claws to attack, suggesting that the Tailypo is merely a powerful animal, and not a demon or spirit. While probably not sapient, the Tailypo does speak, demanding the return of its tail. "Taily-po, Taily-po...all I want is my Taily-po..."
The Piasa is a Native American dragon depicted in one of two murals painted by Native Americans on bluffs (cliffsides) above the Mississippi River. 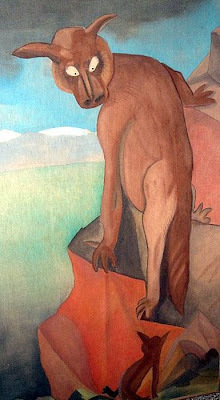 In 1673 Father Jacques Marquette saw the painting on the limestone bluff and stated this "While Skirting some rocks, which by Their height and length inspired awe, We saw upon one of them two painted monsters which at first made Us afraid, and upon Which the boldest savages dare not Long rest their eyes. They are as large As a calf; they have Horns on their heads Like those of a deer, a horrible look, red eyes, a beard Like a tiger's, a face somewhat like a man's, a body Covered with scales, and so Long A tail that it winds all around the Body, passing above the head and going back between the legs, ending in a Fish's tail. Green, red, and black are the three Colors composing the Picture. Moreover, these 2 monsters are so well painted that we cannot believe that any savage is their author; for good painters in France would find it difficult to reach that place Conveniently to paint them. Here is approximately The shape of these monsters, As we have faithfully Copied It." The Squonk is a legendary creature reputed to live in the Hemlock forests of northern Pennsylvania. 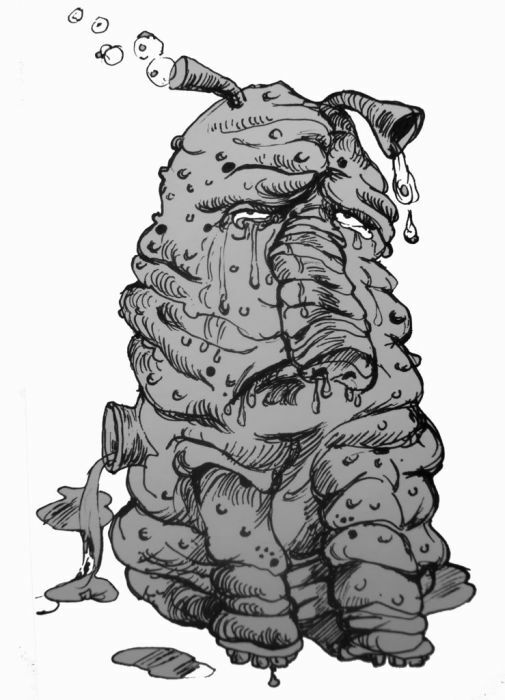 The legend holds that the creature's skin is ill-fitting, and covered with warts and other blemishes, and so it hides from plain sight and spends much of its time weeping. Hunters who have attempted to catch squonks have found that the creature is capable of evading capture by dissolving completely into a pool of tears and bubbles when cornered. A hunter once claimed to have coaxed one into a bag, which, while he was carrying it home, suddenly lightened. On inspection, he found that the bag contained only the liquid remains of the sad animal. Mothman is a legendary creature first reportedly seen in the Point Pleasant area of West Virginia from 15 November 1966 to 15 December 1967. 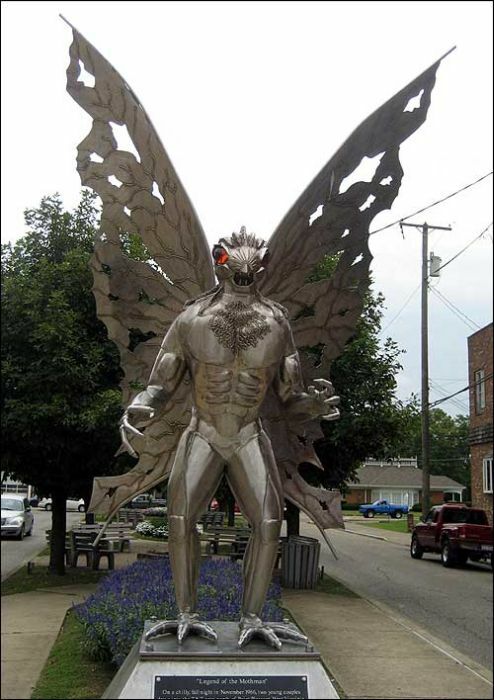 The first newspaper report was published in the Point Pleasant Register dated 16 November 1966, titled "Couples See Man-Sized Bird...Creature...Something".